With Kathy at work and my oldest son getting ready to go to work as well, and with less than 1 week till my knee surgery I wanted to get in a full morning of birding. The rain that has persisted for the past few days was starting to let up as I approached the beach at Caesar Creek. It was going to be a good day because not only was Jonathan meeting me but so was his wife Samantha. I get along so well with them even if the birding was bad the company would be enjoyable. Duck hunting season opened this Saturday in the southern part of the state and I was hoping that the Ross’s Geese that have been on the beach for several days were still there. I wanted to try and improve on the quality of photographs from the other day, however with the overcast skies and drizzle my efforts were about the same. The Ross’s Geese were feeding on the beach and moving away from us. Instead of circling around them to get a front view of the birds, I opted to stay put and try for a shot so I wouldn’t scare them off. I saw a couple of duck hunters leave their blind and look our way as we watched the geese. I’m sure they were licking their lips in anticipation of us spooking them into the air. They’re such a wonderful rarity in this part of the state I can’t imagine anyone wanting to shoot them. However hunters have every right to hunt them as I have the right to view them from afar. I just don’t want to be around if they get blown into smitherines. We left the beach a made a quick move over to the North Pool boat ramp area to see if anything was on the lake other than decoys, which outnumbered real ducks by overwhelming figures. 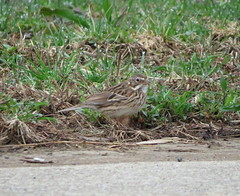 So we spent our time there watching a large group of Passerines feeding along the edge of the lake. Afterwards we changes locations again, and this time we visited the feeders set up at the Visitors Center. From the inside of the Visitors Center we watched in awe as a Gary Squirrel figured out how to eat from a squirrel-proof bird feeder. As the morning was waning we amde our way now to Miami Cemetery in Corwin to see if any of the White-winged Crossbills that were reported several weeks ago made a return visit. Normally you can have some pretty good luck at cemeteries, however this has been my second time at this particular cemetery and it’s been kind of disappointing. Time to re-locate! 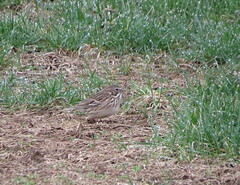 News that the feeders at Spring Valley had been stocked is good news. The feeders that are installed at Spring Valley are an array of store bought tube feeders with platform perches on the bottom, to massive homemade jobs that use discarded oxygen cylinders and PVC pipes. Their suet feeder is a large branch with cages attached to the sides that are then stuffed with suet. Despite seeing several Hairy Woodpeckers, the most I’ve seen at one time, they never came to the suet feeder. However the Downies thoroughly enjoyed what was being served. We made our way down the trail to the boardwalk where a couple of Golden-crowned Kinglets and a Brown Creeper added to our day list. As we approached the boardwalk the discussion turned to Marsh Wrens and the reliability of Spring Valley to view this reclusive species. Being the first week in December one wouldn’t think that Marsh Wrens would be around, but we were mistaken when we caught some pretty good views of not 1 but 2 Marsh Wrens as they moved through the dense grass no more than 10 feet off the boardwalk. But I think the best was when we were leaving. If your walking onto the boardwalk, going towards the observation tower, the 1st open water slough on the right, in the thick grasses and cattails we had some very interesting calls and movements. The bird never showed itself, but after Samantha played both recordings of a Sora and a Virginia Rail it was determined it was a Virginia Rail. 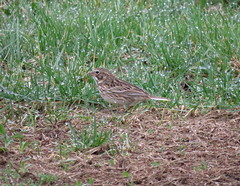 Both birds pretty rare for December. Miami Cemetery & Caesar Creek S.P. As the Thanksgiving Holiday comes to a close I hope that all my readers had a special day with their friends and family. The hustle and bustle of the holidays can be stressful for everyone, and as we all know one of my favorite de-stresser pastimes is do a little birding. But first we have to get through the holiday with the out of town visitors, hosting the feast, venturing out on Black Friday not once, but twice. Finally purchasing a new bird mobile, which can be as stressful as hosting the feast. So my 4 day weekend was a blur of activity geared towards the hyperactive individual, not one in his late 50’s. In need of a birding distraction my plans were to keep it kind of short and local, because there was a nap coming on. Some local buzz lately was that there has been some recent sightings of White-winged Crossbills at Miami Cemetery just outside of Waynesville Ohio. Just across the Little Miami River from Waynesville sits the sleepy little hamlet of Corwin. 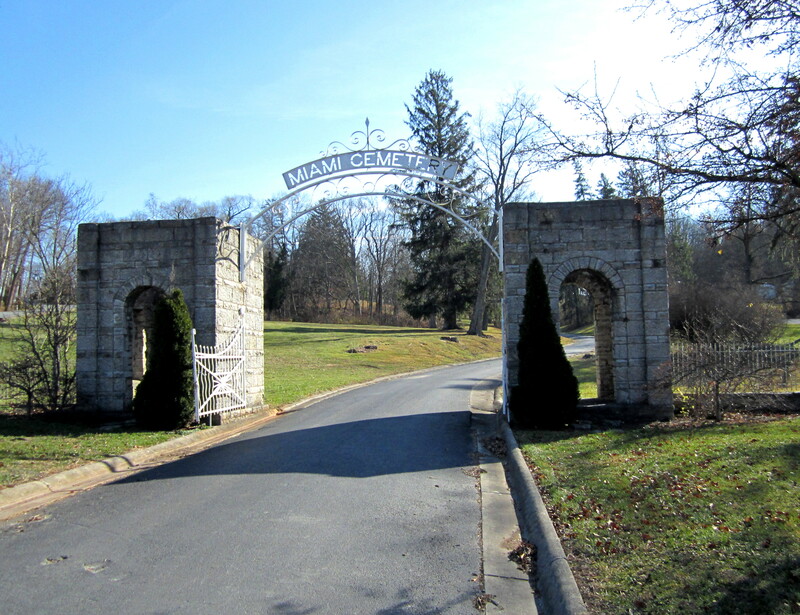 In the heart of the town, atop a hill that overlooks the Little Miami valley is Miami Cemetery. A nice size cemetery with a good selection of Evergreens and Hemlocks. As a matter of fact I was surprised at how many and the large size of the Hemlocks. And boy were they loaded with cones. And being such, one would think that finding some Crossbills would be easy. No not today, however the potential is definitely there. The wind was picking up and it seemed that the birds were hunkered down as I drove from one spot to another, get out of the new bird mobile, wander around and cover all the Hemlocks and Evergreens for as long as I could stand it. Timing is everything when it comes to birding I feel, and the time of day I was here just wasn’t right for birding. But there’s always next time. Leaving the cemetery I followed the road I came in on which dead ends into Rt. 73. My plan was to stop at Harveysburg Road and check the lake for some duck activity. However at the intersection of Corwin and Rt. 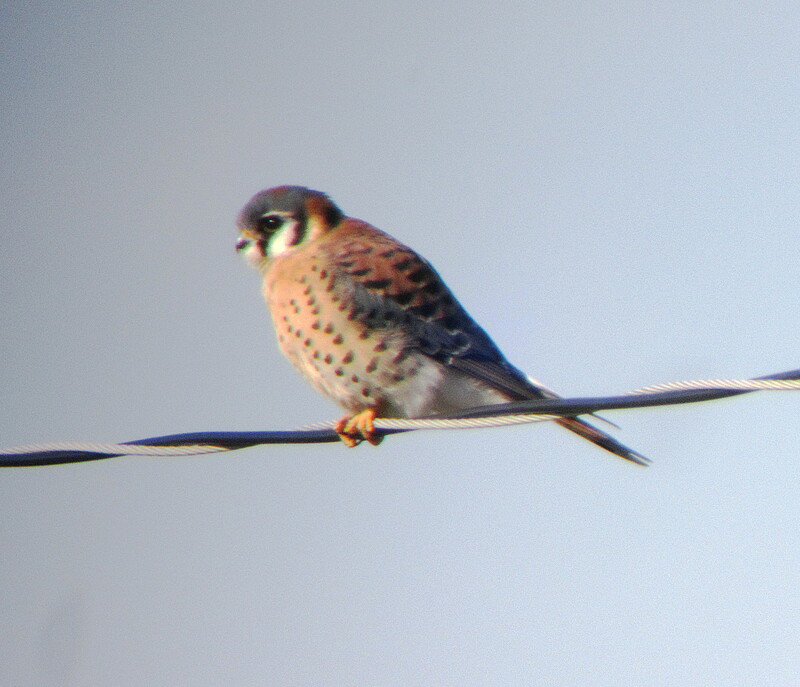 73, perched on a electrical wire trying to balance in the gusty wind was an American Kestrel. With the population in rapid decline I always take notice of Kestrels as I drive country roads while I’m out. And this particular one was sitting pretty good, and with the sun towards my back I thought why not pull over an try to digiscope the bird. One thing I’ve noticed when trying to take a picture of any kind of Hawk or Falcon is that they know what your doing at all times, and they’ll only sit still just long enough for you to get your gear set up, then they’ll fly to another perch. Laughing at you. Being at the top of the food chain in the avian world has it’s perks, and annoying photographers like myself brings pleasure to them in a sadistic kind of way, even though they don’t show it. Leaving my Kestrel friend I made my way to Harveysburg Road and checked out the lake. And without fail it seems the last few times I’ve been here it’s been winding and the lake is real choppy. Common Loons have increased in numbers and they were scattered all over the lake. A few small rafts of Redheads, Mallards, Ruddy Ducks and a few Buffleheads were all that could be seen from my vantage point. So now with one holiday over and another looming on the horizon, attempts to get out more, especially during the week will become a priority. My knee hasn’t improved enough to please my doctor, so the time has come to have my knee scoped to see what’s going on. This little procedure will undoubtedly have me laid up for a few weeks, which will cut into my birding. But I’m tired of the pain so lets get it done.